Graduation rates in the California State University (CSU) are increasing, yet a majority of entering transfer students and first-time freshmen do not graduate “on time,” even though they aspire to do so. New research into student experiences, undertaken by the Education Insights Center (EdInsights) on behalf of the CSU Student Success Network, sheds light on the various factors impeding timely graduation. Based on a survey and focus groups involving students at three CSU campuses “Get Me from Point A to Point B:” Student Perspectives on Barriers to Timely Graduation at the California State University explores the obstacles, both personal and institutional, facing CSU students as they navigate their ways through college. Students frequently cited not being able to get into a needed course because all sections were full as a barrier to making timely progress toward a degree. While it is often assumed that CSU students work an excessive number of hours to afford college, most reported working fewer than 20 hours per week; financial concerns weigh heavily though, and influence students’ interest in timely graduation. Time management and study skills pose a challenge, with about 50 to 60 percent of students spending less than 10 hours per week studying/preparing for class, regardless of their courseload. About half of students report they are satisfied with the quality of advising services, yet many indicate they are hesitant to see advisors because of difficulty getting an appointment or because they believe the advice is unhelpful or wrong. The system and campuses are working to support students in achieving their goals and to improve graduation rates. The students’ perspectives described in this report can help support current efforts to create a smoother pathway. 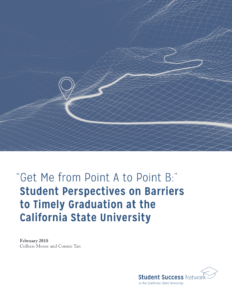 The full set of survey results from Get Me from Point A to Point B:” Student Perspectives on Barriers to Timely Graduation at the California State University can be found in the Technical Appendices. CSU campuses interested in replicating the study can find the survey and focus group protocols in the Technical Appendices. This work is licensed under a Creative Commons Attribution-NonCommercial 4.0 International License.